As I look at my reflection in the glass, I see nothing. An empty shell. 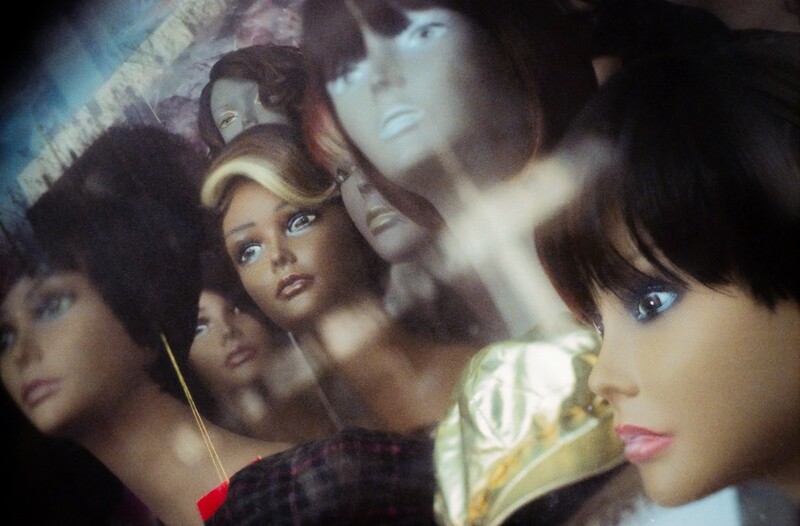 The other women around me – motionless with vacant eyes. Are they thinking the same thing? Paralyzed from the neck down, I can’t reach out to any of them. The men walk by and stare but rarely even slow their pace before moving on. I’ve tried to move my lips. Tried just turning. Nothing. Before every attempt, fear solidifies in my skin and locks me in place with this stupid, boring expression. It didn’t start out this way. I was all over the place. Looking this way, looking that way. Hair flying around with heels-six-inch-high, palms-to-the-sky energy. Disco lights were in my eyes – in my soul! My heart pounded with bass lines. Glitter flew around and dreaming became reality. Now, it would seem, I’m an absolute waste. Did … did someone just say something? Oh, I thought it was about me. I guess – AGHHH! What happened to my hair?! Don’t look at me! I’m hideous! Wait, What’s going on?! Oh. Oooohh. Well look at that! A blonde streak to match this love freak! Guess who’s back in town! Yeah, you better get that TRASH out of here! Trashing up my view! Mama’s new wig needs some sun!! Love the unique point of view in this. I liked the parenthetical detail of the Butterfinger wrapper and how it seemed like a whispered aside. Thanks for sharing your work. Love the paragraph beginning, “It didn’t start out this way,” and the contrast you build between life/motion and frozen/empty. I caught (most of) the Twilight Zone marathon on New Years Day. This story brought me right back into that realm.